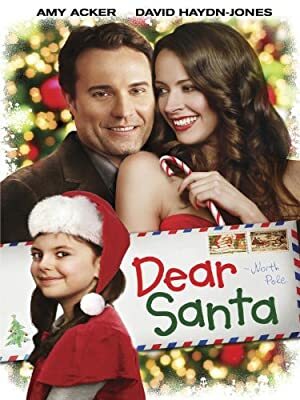 Dear Santa (2011) – What's New on Netflix Canada Today! Jason Priestly takes the helm for this warmhearted romantic comedy about a die-hard party girl struggling to change her frivolous ways. Crystal (Amy Acker) comes from a wealthy family. She loves spending money. Her parent’s money. When they decide it’s time for her to make something of her life they give her until Christmas to clean up her act. Should Crystal fail to comply, her credit cards will be promptly canceled. Petrified at the prospect of having no money and no boyfriend, Crystal has a flash of inspiration when she finds a letter to Santa from seven year old Olivia (Emma Duke). In the letter, Olivia asks Santa to find her widowed father Derek (David Haydn-Jones) a new wife. He owner of a local soup kitchen, Derek has dedicated his life to helping others. Though Crystal has never set foot in a soup kitchen, she soon seeks Derek out and begins volunteering her time in an effort to get closer to him. Little does Crystal realize that Derek’s scheming girlfriend (Gina Holden) will do anything to keep her man to herself. Meanwhile, Crystal remains determined to prove herself, despite the obstacles that stand in her way.